Picture your doctor's car. Maybe it's a Porsche Panamera, or a Mercedes G class. 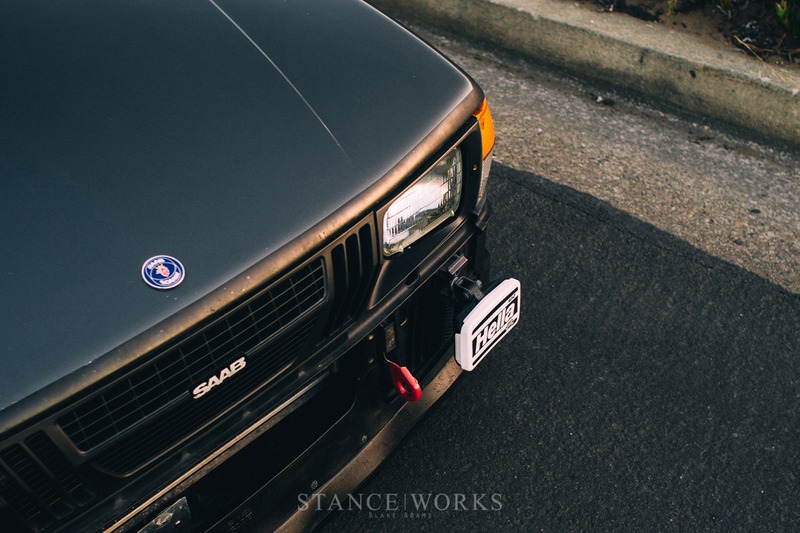 It could be a bit fancier, or maybe a bit more conservative, but chances are, an '80s Saab isn't what comes to mind. 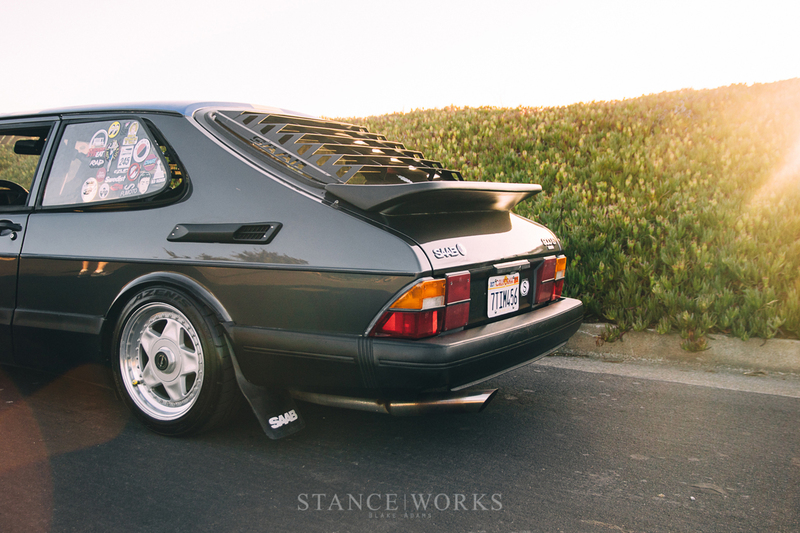 "Unlike the typical Saab stereotype, I’m not an architect or a dentist or over 50," Anthony tells me right off the bat. The humor and inherent oddity of being a Saab owner isn't entirely lost on him though. As a 26-year-old medical student well on his way towards his MD, you might just catch him climbing out of his '89 Saab 900S in the faculty lot. Okay, maybe not unless you're lucky. He does have a 2008 Saab 9-3 Turbo X that he drives on the day-to-day, which means that Anthony is, without question, a Saab guy. 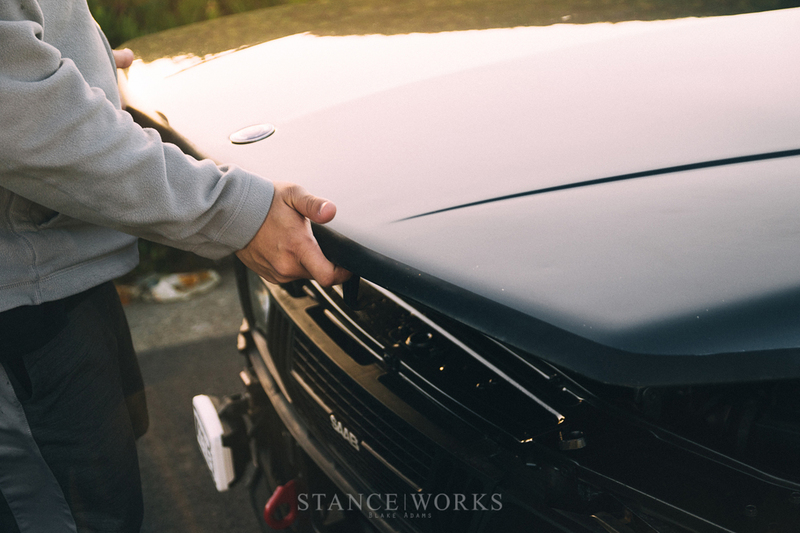 How, why, or where the love for the Swedish marque began is as good a question as any, but Anthony was prepped with an answer. "I went to a small boarding school in southern California. We weren't allowed to have laptops with internet access, or gaming consoles, or anything like that. It was strict to say the least. 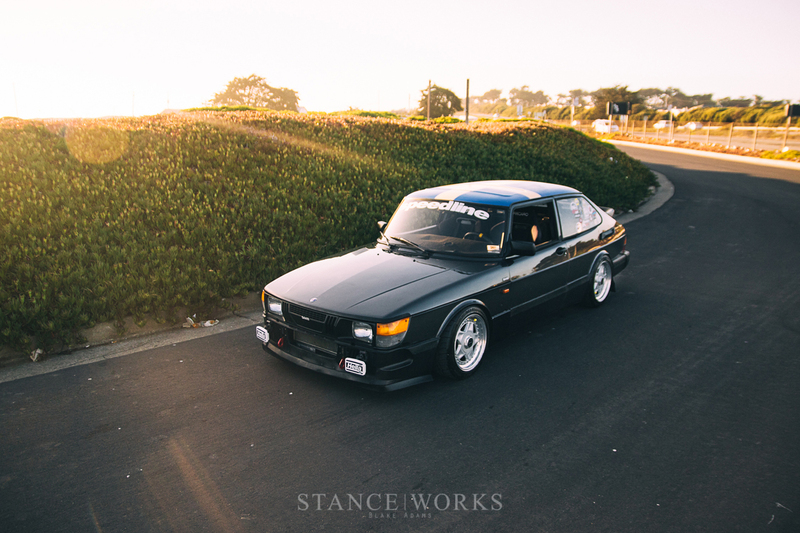 ... [but] I had a subscription to Motor Trend and would purchase issues of Super Street." Anthony's love for automobiles flourished, and was the catalyst for his friendships throughout his high school years. By the time he was in college, his enthusiasm for cars had flourished, leading him to create the wildly successfull carsxhype.com (now known as carshype.com) to further his ability to share his interests. There was, however, one small problem. Anthony still didn't have a car of his own. "My mom was always pretty opposed to my passion for cars, because she saw it as a distraction from my sturdies and potential future career. She always told me she was never going to get me a car and I would be getting my own car if I ever got one." Eventually though, it does seem she came around, and during his sophomore year, an opportunity arose. "The catch was it had to be under $4,000, have 4 doors and under 100k on the clock. The furious Craigslist search began, but everything that I thought was cool was shot down. Accord wagon? Too many miles. Lexus SC300? Not enough doors." Eventually, though, it was a 2000 Saab 9-3 that piqued his interest. Knowing nothing about the marque but expressing an affinity for the car's cleanliness, power, and of course, the fact that it fit the requirements. With that, his love for the brand was born, in the years following, acquired quite a few of them. There was a stint with a 2004 Saab 9-3 Aero, and of course his daily driver, the 9-3 Turbo X. The gem of his fleet, though, is this particular '89 900S. 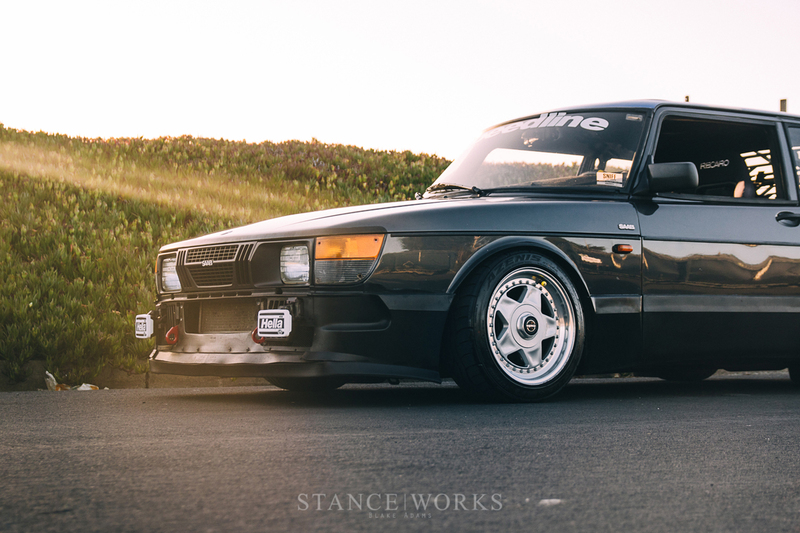 As an ongoing project for Anthony and his girlfriend, it exudes style, character, and the uniqueness only a Saab can offer. Anthony initially admired this car from afar. 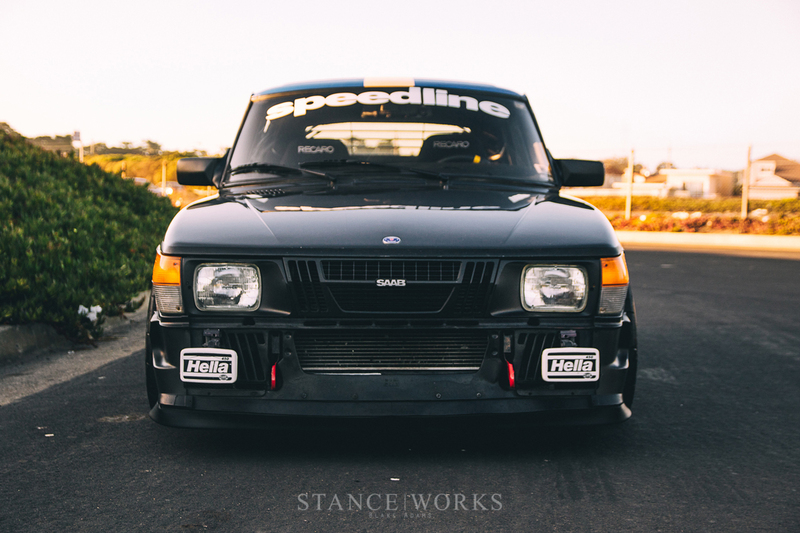 Belonging to a fellow California Saab Club member named Pat, it was a car Anthony would encounter often, such as at events and shows, but it was a far cry from something he ever imagined owning himself. Pat, on the other hand, needed to downsize. With 9 Saabs to call his own, his wife pushed for him to thin the herd. Pat listed the car for sale, and Anthony decided to make the 3-hour drive to see the car in person. "I talked it over with my girlfriend and we decided it would be a cool project for both of us work on together." With that, he made the purchase, and began the trek home. "Just leaving Pat's neighborhood was a challenge. The 900 would shoot out of reverse, and you have to be gingerly with it. I didn’t know this, so while making a 3 point turn, I almost hit his neighbor’s truck. On top of that, driving it up to highway speed was difficult, and it was impossible to find 5th gear. We actually had to drive 15 minutes back to Pat's house so he could show us where 5th was. 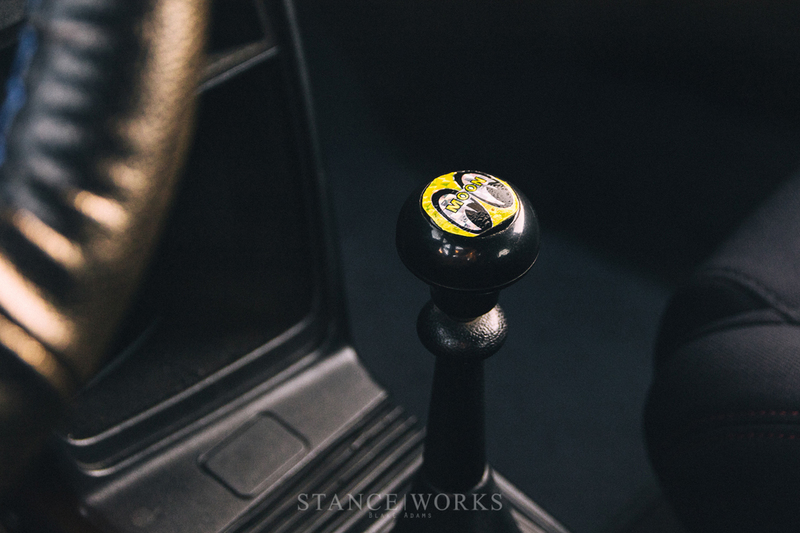 I didn't learn to drive a manual on this car but it was the first manual car I owned." It didn't take long for Anthony to find his groove, and following that, parts were on order left and right. 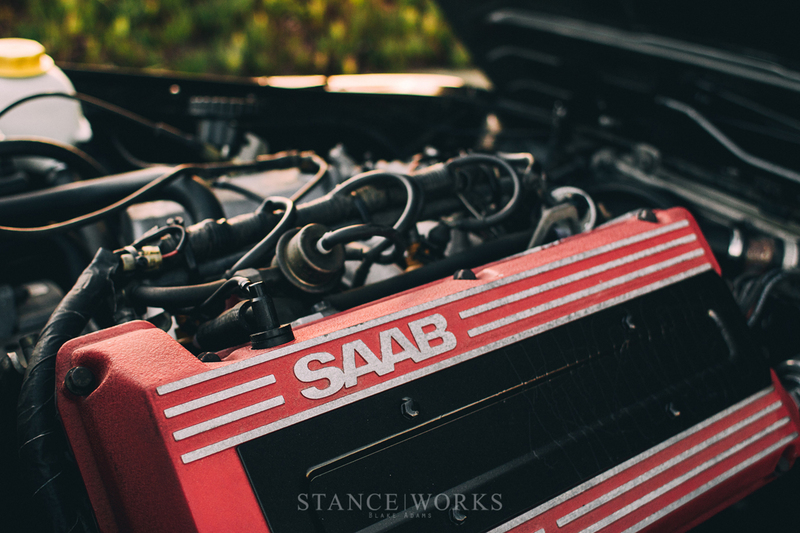 Eight months later and he completed the Saab you see today, home to a slew of parts and pieces that make it what it is today. 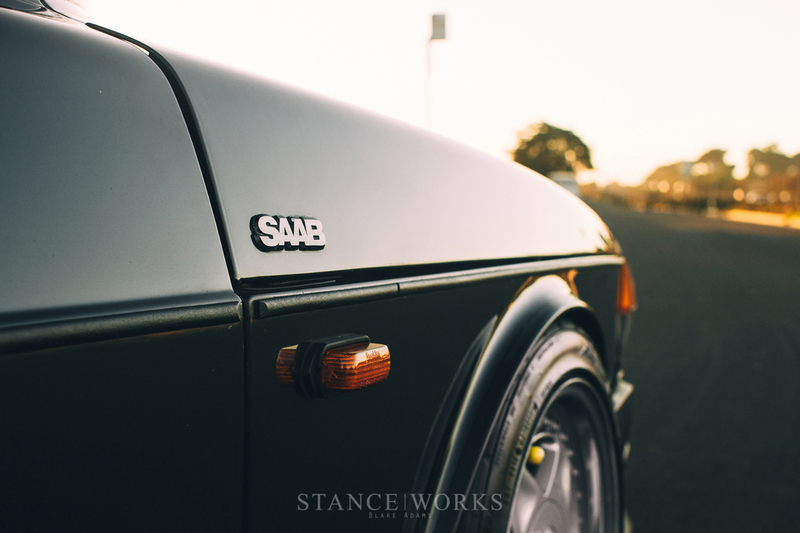 When it comes to the car's exterior, it's worth highlighting some details for the non-Saab savvy. The nose of the car assuredly looks different from your average stateside 900, and that's thanks to a pre-'87 nose retrofit. Instead of the brickish headlamps the 900 is known for, this one sports a substantially different style. 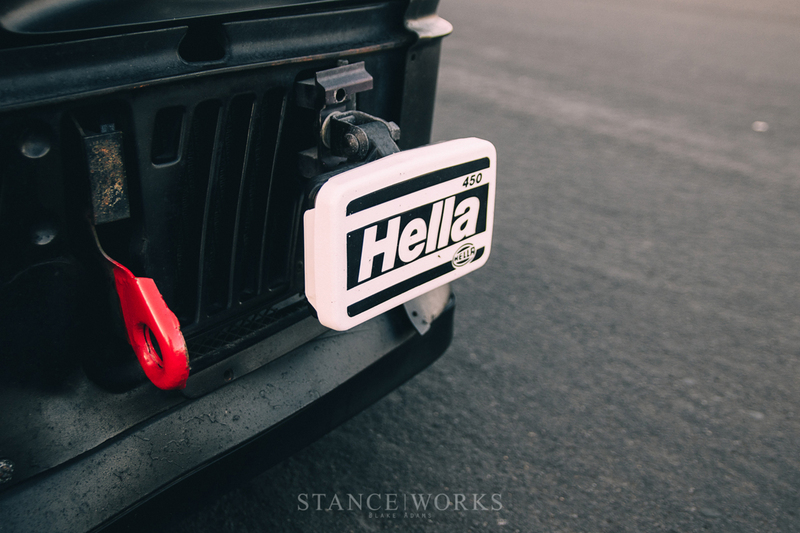 What's missing is the pre-'87 large bumper, and in its place are a pair of Hella foglamps. Saab SPG panels have been fitted to the car's exterior too, which drastically change the look of the car. Standing for Special Performance Group, it's a bit like M trimmings for a BMW. 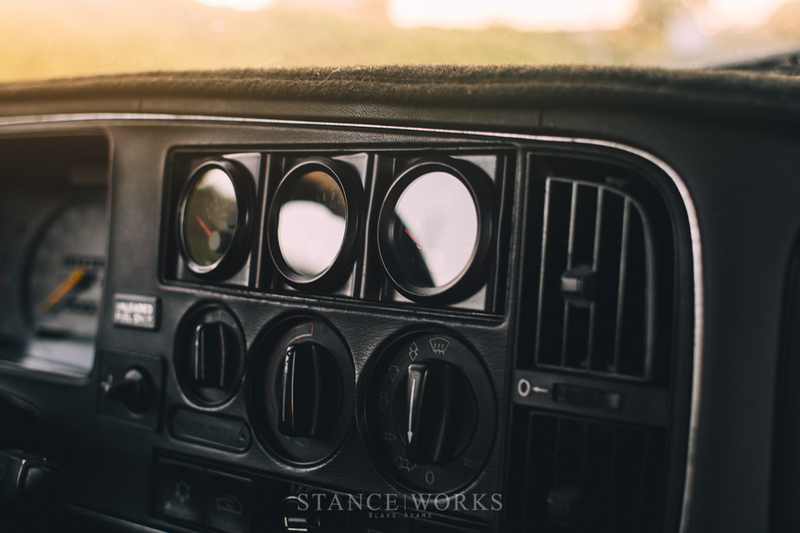 Finding them was blind luck, too, as pre-facelift SPG panels were only available in the US for 1985 and '86. Out back is the "whale tail spoiler, and a beautiful set of louvers, which help add a bit of style and flair to the car's already-unique flavor. A Swedish flag is painted on the roof, adding a bit more quirk to an already quirky machine. 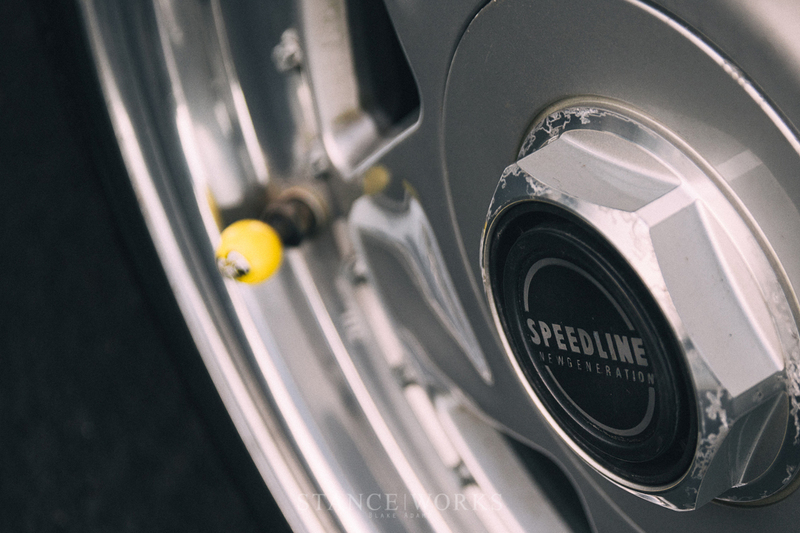 The Speedline Mistral wheels measure out to 16x8 +3 on all four corners, with Falken RT615Ks offering some hearty grip. 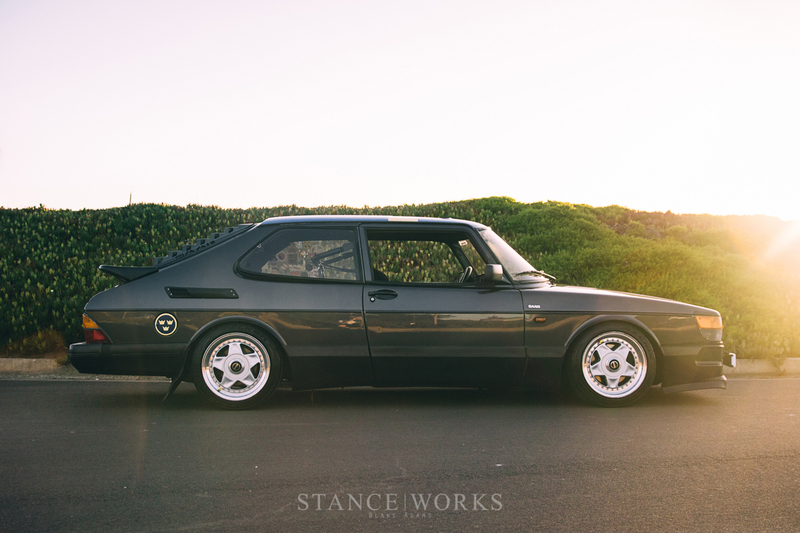 The wheels themselves stand as Anthony's favorite component of the build, with their style and rarity both coming into play. 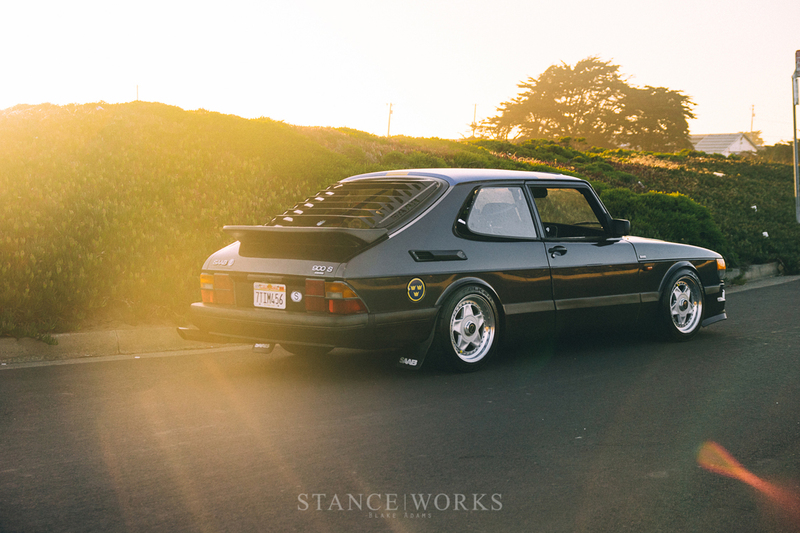 For suspension, the coupe sports a set of KYB struts and modified Saab SPG springs - a simple but tried and true combo. Inside, the interior has received some bits and pieces too. 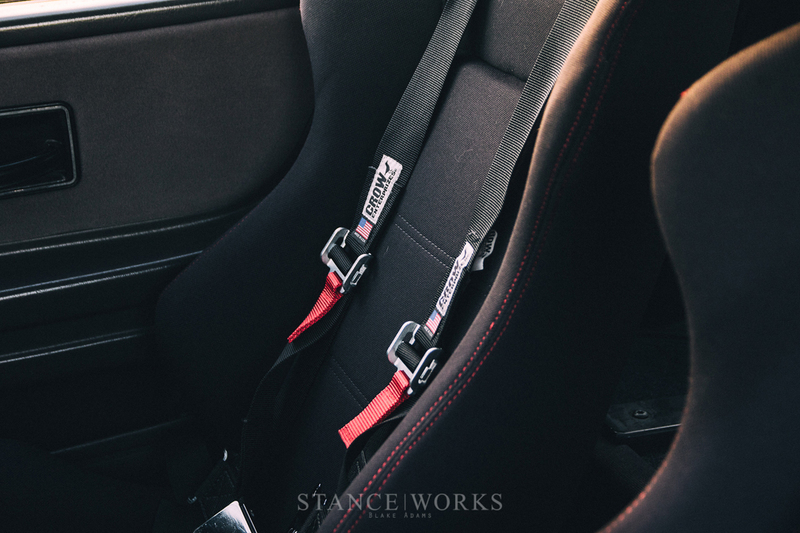 A TDA Motorsports harness bar sits behind the Recaro bucket seats, and Crow Enterprises harnesses snake their way through the seats for safety. 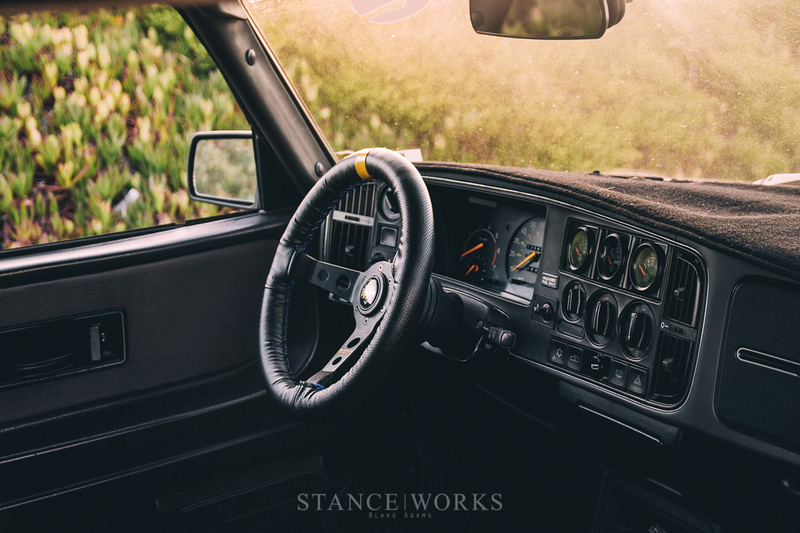 A Momo Corse steering wheel connects Anthony to the road, and dash-mounted VDO gauges give the necessary feedback to keep the backwards car on the road. 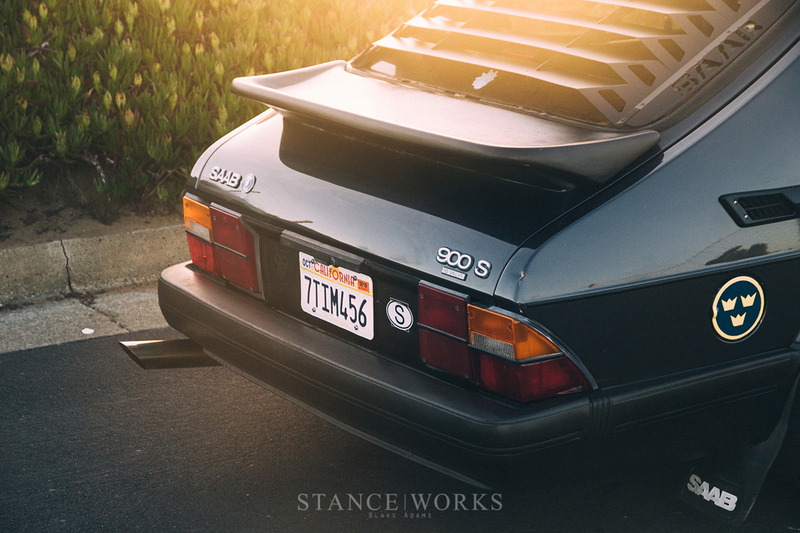 As a car greater than the sum of its parts, Anthony's Saab 900 was an absolute joy to encounter, and in many ways epitomizes the foundations of StanceWorks itself: creativity, uniqueness, style, and most importantly, unwavering passion. A well-deserve feature some time in the making. So here's to one Saab fan, and of course to the dozens of others. Keep those quirky cars on the road. We appreciate them too.